Far be it for us to argue with order of operations, but an apparent Intel Retail Edge Program promotional email has revealed a contest where those who pass this month's training can win one of two MacBook Pros with Intel Core i5 processors inside. Only catch is, that's a model that doesn't yet exist -- whoops! Don't know how long the company expects those winners to wait, but we've gone ahead and kept our calendars clear for the end of the month, just in case Apple feels the urge to send out any last-minute press conference invites. 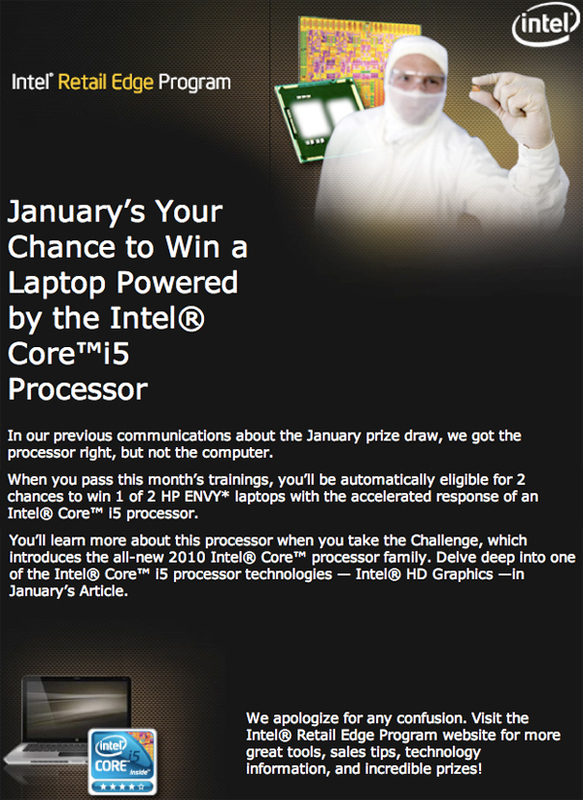 Update: We've been sent a new flier from Intel that "corrects" the contest. The prize is now one of two Envy 15s with Core i5. Sure, we've joked about the physical similarities before, but did someone really mix the two up that egregiously? Only time will tell. Correction email reprinted after the break.